…working to preserve this historic area of natural beauty, designated as a key wildlife site, and highly valued by the community & visitors to Stroud. The most recent appeal to develop on these sites has been withdrawn in December 2015. 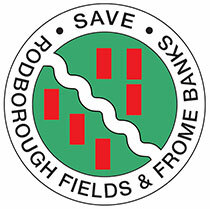 With the Stroud District Local Plan in place from November 2015 the meadows and river banks are now protected from speculative applications. These areas are highly valued by the community & visitors for their heritage, wildlife, access and amenity uses. Lowland meadows and river valleys are vitally important for the character of the Stroud Valleys and the Cotswolds AONB. If you would like to help preserve and protect these green spaces, you may wish to join our mailing list below. We will continue to work to secure the future of these areas for wildlife and amenity use. The meadow land is designated as a ‘Key Wildlife Site’, the river bank is a valued Gloucestershire Wildlife Trust Nature Reserve. Please help us share how valued these areas are for the community and visitors to the Stroud District. You can find us on Facebook and Twitter – @SaveRodFields. You can email, share and bookmark our site using the buttons below left.